David is an expert on the various styles of Punch figures and in identifying their makers. 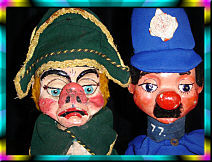 He has one of the largest collections of Punch and Judy puppets in the world and is frequently called upon to identify and value figures by the leading auction houses. 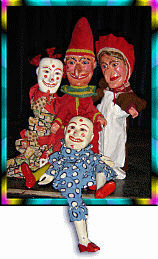 His interest is not limited to Punch and Judy puppets and ephemora since he also collects some Pelham Puppets as well as Ventriloquial figures. 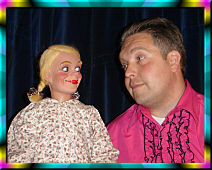 His latest aquisition was one of the famous Archie Andrews ventriloquist dolls used by Peter Brough and sold at Greenslade Taylor Hunt Fine art Auctioneers. Although a keen collector David is also eager to share his enthusiasm. He loans Vent figures and Punch sets for displays and exhibitions, and also hires out items of his collection for films and theatrical productions. Many famous makers are represented in David's collection including the vent work of Leonard Insull and Punch figures by Quisto, Wal Kent, Bryan Clarke, Tony Green, Joe Parsonage, Teddie Corden , Geoffrey Felix, Miraiker Battey, Mary Edwards and a host of others. 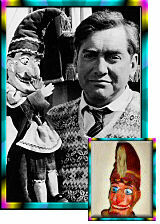 One of the real prizes of the David Wilde collection is surely the Wal Kent Punch figure which was used by Tony Hancock in the film The Punch and Judy Man. Tracking down this puppet took years of detective work by David and his Grandfather and the figure was eventually located on the Continent. Having found the owner it then took a great deal of persuasion before this important piece of Punch history could be returned to Britain to join this unique collection.